You’ve likely never heard of jam cake. It’s a closely held regional recipe to the south. One that families pass down from generation to generation, bring to celebrations, and give to neighbors and friends. 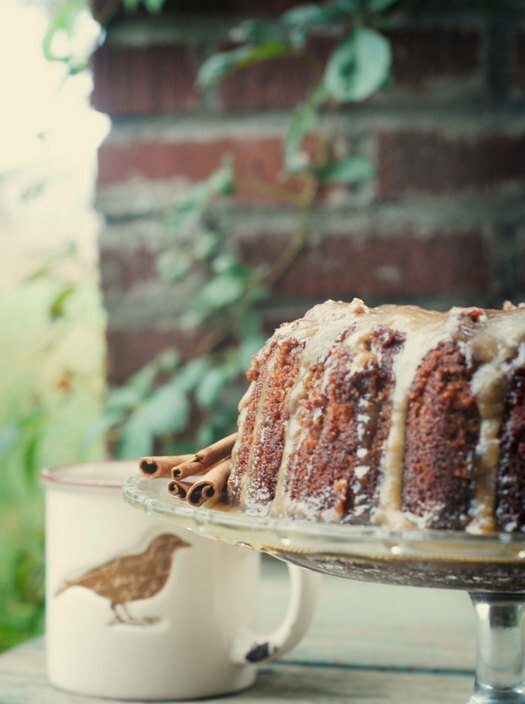 Jam cake is a dense, moist spice cake covered in a rich, creamy glaze. And while the recipe varies from region to region, one thing remains the same: the addition of delicious jam. 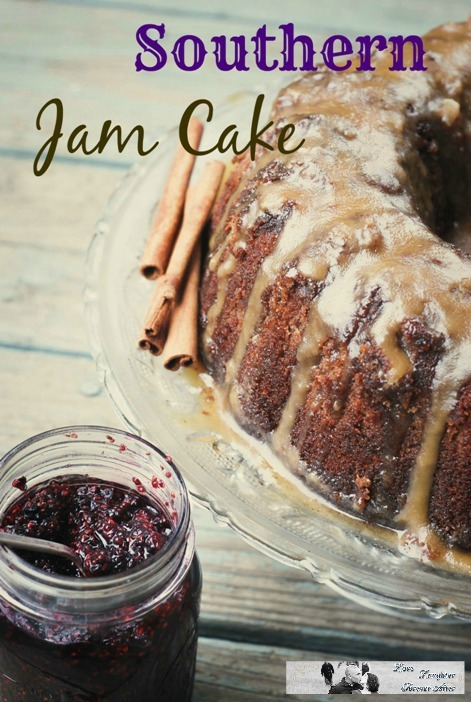 Perfect for fall parties or Christmas, this blackberry jam cake tops the list of things I cook for my husband, and now I’m sharing it with you! The last time I made this cake, I had two very large problem stemming from one crisis in my home: I had no buttermilk, and no cream for the frosting. So, I used the milk I had to make the buttermilk with the addition of lemon juice, and then used coffee creamer (Yes, you read that right) instead of heavy cream. And guess what? I’ll never use milk in that frosting again. I had caramel flavored coffee creamer, and it took that frosting to the next level. It was divine. Preheat oven to 350 degrees. Grease a Bundt pan or two cake pans liberally. You can also flour the pan, or sugar the pan. In a mixing bowl, cream together butter and sugar until fluffy. Add eggs, one at a time, mixing after each addition. In a separate bowl, combine dry ingredients. Dissolve baking soda in coffee or water, and then add the liquid along with the jam. Finally, add dry ingredients, alternating additions with buttermilk. Bake until cake springs back when touched, or until a toothpick comes out with just a few crumbs, anywhere from 35 mins (two cake pans) to an hour (Bundt pan). Set cake out to cool. In a sauce pan, whisk together all frosting ingredients, and cook over medium heat until it starts to thicken to your desired consistency. This should be a glaze that hardens on the cake. Typically, I try to cook mine to somewhere in the 230-240 degree range. As with most cakes, it’s best enjoyed the 2nd day, but it’s wonderful the same day as well. 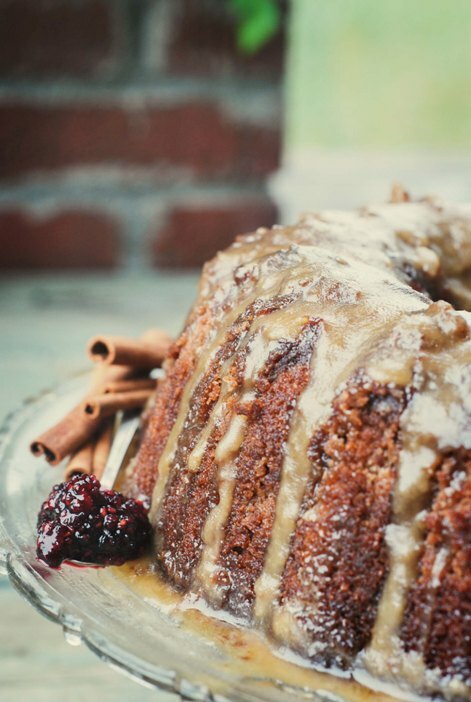 Enjoy this Blackberry Jam Cake recipe, and let me know your thoughts! That cake looks so awesome, I could take a piece right now. Also I love blackberry jam. Kathleen recently posted..Fear of the Unknown Recently updated ! My mom and I used to make several of these cakes at one time, wrap them up well in foil and then box them to send to my brother-in-law when he was in Viet Nam. It usually took about 10 to 14 days for the boxes to get to him and all of the guys where he was stationed knew that when Larry got packages, it was usually from home and had homemade goodies in it. They would all be waiting around when he opened the first box and dozens of hands reached in and grabbed as much of the cake as they could hold and the box was emptied in a heartbeat! That’s why we sent several at a time. Most of the guys were gone after the first box, some had learned from experience that if they were a little patient that they could get more than just a handful. So, the second box usually went just about as quickly as the first. And then Larry had the third box for him and his bunk mates and they got to enjoy the goodies in peace. I also started sending them to other guys I was writing to in Viet Nam, one was a Marine, one was Army, Larry was Air Force. I found a magazine with lists and lists of guys who just wanted someone from home to talk to and I could just mail the letter addressed to “word from home” and whoever wanted a letter just took one. Some I heard from, some I didn’t. One even lived in my own neighborhood in Phoenix. Anyway, they all loved the cakes and cookies from home, all of them sent notes saying Thank You, which were nice, but not necessary in our minds. We were just trying to help some guys who were far from home and just wanted to touch a piece of home again. So thanks for the recipe and the memories. They are all good. I know your post is a year old, but I just had to reply. I have a Blackberry Jam cake recipe (very similar to this one) that has been in my father’s family for many generations. I have very fond memories of my great-grandmother (who was nearly blind by the time I was old enough to remember) churning out endless Jam cakes at Christmas time. It was a gift I looked forward to every year. My dad (her grandson) was a Marine and served as a tank commander in Vietnam back before my parents were married. He tells a story of being stationed over there and Nanny sending him two jam cakes. He described opening up the box and smelling those cakes bringing him right back to her house at Christmas. He savored every bite, shared with some buddies, but did his best to stretch those morsels as long and as far as they would go. There was no greater service she could have done for him than to send those cakes. When I read of what you’d done for our servicemen, it struck such a familiar chord because of my dad’s story! I just wanted you to know how far those memories go since you gave the same gift to some men who sacrificed so much for our country. I hope you have a merry Christmas, Judi! Sounds really wonderful and delicious! 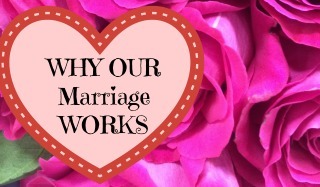 Thanks for linking up with us at SNF! Pinned to our party board! This sounds great! Thanks for linking up with Show Stopper Saturday! I am so sorry. I made this cake with Caramel Icing and it is the worst jam cake I have ever tasted. Dry. So dry that it crumbled. I followed the directions but it just didn’t work for me. After the butter, jam, raisins and nuts, it is the most expensive baking mistake I have ever made.